Music is food for the soul, and my soul was overdue for a feeding. If you’ve been reading this blog, you’ll have noticed my love of harp, bards, and music in general (just type harp into the search box to find related posts). Today, I was able to take a journey back in time to see, hear, and learn about early and medieval Irish harps. First was a concert by Siobhán Armstrong. The venue was a small, beautiful chapel in the Poor Clare’s Monastery on none other than Nun’s Island. Interestingly, the chapel had a prayer room behind the altar and they folded back the doors to allow the nuns, dressed in full traditional habits, to listen as well. The tunes were from the earliest documented harp music from the 14th through 18th century. 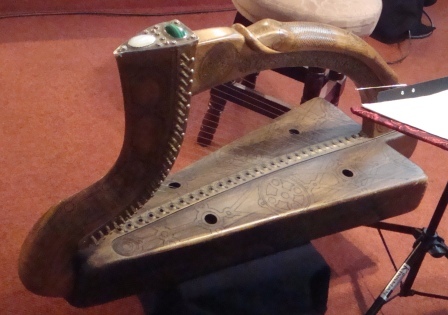 A lecture at National University of Ireland, Galway provided not only background on the unique instrument, but information on how some of the early music was documented. As bards and harpists were part of an oral tradition, what survives is only a fraction of what was performed in the Middle Ages. It was only because of a 19 year old music prodigy named Edward Bunting, attended a gathering of Northern Ireland harpists in 1792 to learn and write down as much as he could from the 10 harpists (nine men and one woman), that anything survives at all. Only one of the ten was a truly medieval harpist, playing the instrument with the finger nails instead of the pads of the fingers. The Early Irish Harp is quite different from the current models and was found as far away as Florence, Italy, in the south and Poland in Eastern Europe. They date back to before the 10th century and were in use up into the 1800’s. The back piece or resonating chamber is hollowed out from a single piece of oak or willow, which makes it more susceptible to environment changes that require constant tuning. The curved front pillar wasn’t just carved into that shape from a larger piece of wood, but was actually a branch that had grown in the profile, another aspect that affects the resonance. Most notably, the medieval harp had 29 metal strings, made of brass, silver, and/or gold. Modern harps use gut, nylon, or carbon strings and generally have 34 strings. I overheard Siobhán explain to another patron that the gold strings are 18 carat, and although we think of gold as a soft metal, they have a method of refining it so that it isn’t as fragile as one would expect. Only 18 Early Irish harps remain and of that only 3 are the medieval variety with one located in Trinity College in Dublin and the other two in Scotland. Siobhán’s gorgeous harp was a 10 year old replica of the medieval harp, and by her admission, newer models continue to become more authentic. The music is ethereal and like much of the traditional Irish music, touches a place in the core of my being that nothing else ever has. Even the renowned Sean O’Riada recognized the beauty of the instrument, attempting to recreate it using the closest thing he had at his disposal, the harpsichord. A truly entertaining, informative, and enjoyable afternoon. 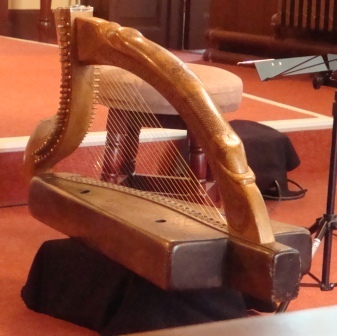 For more information on Early Irish Harps check out http://www.irishharp.org. I share your passion for this instrument. How lucky to be in Ireland and to hear Siobhan live! Cheers!